Ommadon break with their numerical nomenclature in this, their sixth full-length album, but it’s no surprise that they continue the tar-thick intensity of their guitar-and-drums drone of the past five. Indeed, as the band themselves have said: “Ommadon is self-titled because this is what we set out to be from the beginning. This is not entertainment. This is not easy listening. 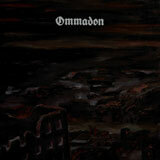 Ommadon is pure and primitive heaviness.” They are not wrong. Even their previous outing, simply titled V, was more approachable than this despite consisting of two tracks dragged over a pummelling 90 minutes. It takes a long time to get into this record, longer still to really explore it. Like the open ocean, it initially appears monotonous and endless. Struggle against it, or even try to find meaning within the vast void, and you will drift forever without release. Accept this, let the peaks and troughs of the single flowing riff carry you off over the edge of the world, and you will find an enlightenment that is as fleeting as it is immediate in the clouds that float above, the dark shapes that hang below. This does, however, make their music very hard to review objectively. Without having seen one of Ommadon’s sweat-lodge live sets or spending time with one of their records it’s difficult not to simply try and hand-wave the question away with talk about walls-of-guitar-drone and maybe even their links to the standard procession of similar bands. Words like monolithic and cyclopean and abyssal come all-too-easily to the fore. It’s not that this isn’t accurate, it’s just that it isn’t enough. When the simple elements come together, and let us not forget that this is ultimately just guitar and drums, then there is a kind of horrible, quantum alchemy at work. A jarring, cracking collision of unutterable forces that, like the tectonic plates under the ocean, clash with an immensity so slow, so full of momentum, that it becomes something more than simple movement. This record is so utterly vast that it doesn’t finish so much as you eventually become numb to it, each individual element dropping away as your consciousness of its effect fades. If you like the feeling of chord after chord being lowered onto your prostate body like the “peine forte et dure”, the late medieval method of torture and execution where weights are lowered onto the victim’s chest (having, ironically, the effect of making it harder for them to confess, easier for the torturer to pile on the weights), then this is for you. If you want to feel like the grim, green-black depths are choking the life from your lungs, then this is for you. If you want to offer yourself fully to the void, then this is for you. If not, then I hear that Beyoncé has a new album out.